A flash of lightning lit up Helkpo’s horns as he walked through Deadwind Pass. He shivered; cold and wet; he was not enjoying this journey. Not only was the environment barren, but there was a distinct sense of dread. The young Druid knew he was in unknown territory and had to be cautious. It was a dark night, lit only by Helkpo’s moonfire bringing down the occasional critter. The boy was tired. It had been a long journey – both this evening and over the last few months. Soon he would meet his new companions as they attempted to investigate the tower of Karazhan. He had followed his mother’s wishes to the word and had brought together a group of fellow lost souls all searching for a path to follow. If he had known it would have come to this, almost certain death, he may not have bothered. What did they know of fighting the undead? What did they understand about the mysteries that were behind the walls of the Tower? Nothing but rumour and stories. He looked into the distance. Medivh’s dark tower stood menacingly against the desolate landscape – a statue to an evil that reeked across this part of Azeroth. Was he ready for this…….? It felt like only yesterday that he had ventured forth from his mother’s hut and had embarked on his new life. Some called him insane, some had laughed in his face, some taunted him with his mother’s death – but still he continued. That he had done. They had been everywhere and nowhere. So many who fitted the description, so many who he had thought would be with him even now. He looked around for a place to rest. His hooves were cutting into his skin and he needed to recuperate. To his left was a small hamlet. He moved towards it, realising as he got closer that it was completely deserted. Not the safest of places to rest, but better than being out in the open. He removed a small lustrous gem from his pocket, and a small hexagonal piece of wood. Inserting the gem into the base a flickering three dimensional image appeared on it. The image flickered and nodded. Vargoth was now his closest companion – a friend who never answered back, a friend who laughed at his jokes, a friend who would never desert him. The boy sat down in the ruins of an old house, pulled out some grainbread and some much needed water, and thought back to when he met the true “first”. He had been stalking the swamps of Zangarmarsh when he noticed a fellow Tauren beset on all sides by ….. well ….. they were creatures he did not understand or want to understand – they were simply Lost Ones. The smell was horrendous; an assault to his senses. These creatures were filthy, but they fought with a one pointed devotion to the kill. His blood had boiled, and he’d felt an immediate urge to protect and aid his brethren – but logic and wisdom held him back. He was far from strong and did not know much about the land. It would have been suicide if he charged in. Water splashed up as the unknown Druid was fighting three beasts at once – no four – no FIVE! This was an honour to behold. Battle cries tore through the night air as one by one the Lost Ones were dispatched. Helkpo could not hear what the Tauren was shouting, he daren’t go too close – but they were dangerous words, spoken by a vicious fighter. Star and Moon fire bathed the forest floor and huge roots were tearing up the ground, grappling the attackers and rooting them to the spot. The water began to run red with the blood of the would-be assassins until there were none standing. The druid surveyed the ground, smiled ruefully and cast a spell to heal himself. Eventually he sat down, uncorked a bottle and began to drink deeply. The heavily muscled Tauren stood up and yelled. The sound was bloodcurdling, but it wasn’t the sound that rooted Helkpo to the spot. It was the words. The Tauren laughed – seemingly to himself – and without further ado, mounted his Kodo and rode away across the marshland. Helkpo stayed rooted to the spot. Could this be one of the ten he was meant to find? There could be no mistaking that the words were the words of from one of his statuettes. He had waited for sign such as this. On so many mornings, he had woken up in tears unsure as to what he was doing. Days and days of his life were being wasted in the quest for….. in the quest for what exactly….. ? It felt like the journey would never end. He removed his large bag from his back and rummaged through the contents. There at the bottom was a small bowl, wrapped carefully in linen cloth. He removed it with all due care and with trembling hooves removed the contents. He found what he was after. The figurine of the warlock still contained the small imp statue, and on it were engraved the words that the unknown Druid had just yelled. Shaking his head in disbelief, Helkpo climbed aboard his mount and rode after the Tauren. It was beyond belief when he met Hëlkpo. Strong and knowledgeable, Hëlkpo had told the boy Helkpo that he too was on a path to meet others like him. They even shared a name. Hëlkpo had also been on a quest to find more like him. It was uncanny how their stories weaved and merged and how they had been brought together. There had been many Druids that he had met and that he had felt would fulfil the prophecy - many that would help him to achieve what his mother had wanted. But the dreams had always been dashed. Hëlkpo, however, was the first who had reached his full potential and fulfilled the legend. Helkpo looked back to the tower of Karazhan. Why had it come to this? Was this the right time? Were his new friends the future? It felt too soon. 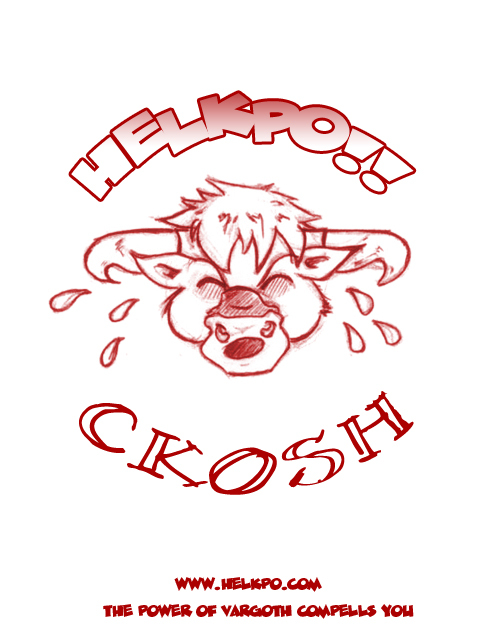 Helkpo remembered some of the mistakes he had made…. Hélkpò and Hélkpó had been two close friends that the boy Druid had felt would be with him till the end. These two had seemed so close and so dedicated. Cruelly, however, the huge Blizzard that whipped across Azeroth in the spring time forced them apart so violently and removed any chance of them being part of the greater picture. What was there to stop there being more like them; others who would never fill their true potential? Nothing. Pushing these ideas of failure from his mind, he thought about the others who were now ready to embrace the fellowship that had blossomed. There had been a “second”. His mother’s words had been so clear to him. How sure he was that they would all be druids. With the “second”, he had had to rethink everything that he held true. This had come as a shock to Helkpo, for it had not been a Druid he found. He had first spotted the “second” in the glades of Terrokar Forest. It had been a long afternoon and Helkpo had been weak with hunger and his battle scars were aching. His armour was long damaged and he was too far from the nearest armour smith to get it all repaired. Staggering on his feet, Helkpo had moved to the nearest stream. He collapsed in a heap and laid his head on the damp turf. Closing his eyes he began to drift off, gently rubbing his cheek against the moss. Feeling a presence near him, he was suddenly alert. This was not the place to let his guard down. Terrible beasts and The Alliance were all over this forest, and he had heard of many killings. Opening his eyes, he saw, not 3 metres away, the menacing form of what seemed to be a ravenous wildcat. Saliva dripped from its jaws, sticking to long forgotten morsels of food lodged in its dagger-like teeth. Helkpo slowly raised himself to his knees, knowing that any rash movement could cause it to be his last. Helkpo watched its lithe body as it took two steps towards him. The cat’s fur was tight against its muscles – this animal was built to kill. The boy druid hesitated. It wouldn’t be right for him to attack this beast; maybe he could pacify it – enough time to leave the area. In that moment the brute pounced, catching Helkpo completely off guard. Throwing himself to the floor he expected to feel the rapacious mouth of a crazed animal clamping to his neck – but there was no pain. Glancing to his left he saw why. The cat had flung itself at a basilisk that had been slowly making headway on the exhausted Helkpo. From the trees, arrows streamed out – almost all of them finding their mark in the scaled hide of the water lizard. Helkpo was speechless. The attack was short and sweet. The lizard lay dead and the cat was now cleaning the gore from its claws. From the trees strode a Tauren. His fur was spotless and glinted in the light. Smiled at Helkpo he offered him a hand. Helkpo took it and pulled himself to his feet. They lit a fire and began to share stories. The new arrival offered Helkpo some new armour as a gesture of friendship. The boy had never seen anything so well made. The links and stitches far surpassed anything he owned and he gratefully accepted. An hour later they hugged and made to leave. Helkpo mounted his Kodo and waved as he left. The other Tauren looking back had a questioning look in his eye. “What is it?” said Helkpo. “Something about your mum being dead?” replied the Tauren. Helkpo stood – stunned. How could he know? He either knew this Tauren as a child – which he certainly did not – or the rules he had been following were not watertight. “What is your name friend” asked the boy. “Hèlkpò” replied Hèlkpò the Hunter. Helkpo smiled. Hèlkpò had come a long way aswell. The band of Helkpii were growing in number and stature. The boy looked down the path towards the gates of Karazhan. He could see a large figure looking around cautiously. He knew it was the “third”. The first female. It had again been a shock to think that there could be a female. It was not that he had no female friends as a child, but for some reason his immediate idea from his mother was that they would all be male. He gazed at her. She was yelling. “HELKPO!” she screamed. He smiled. He knew she wasn’t looking at him. They had met in Shattrath City. She was a fine figure of a female Tauren. Braided locks, smooth fur, with a sense of humour that made the bravest Bull blush. He had never seen a Druid like her before. Every Druid he had known was either a warrior or a healer, and although she knew of these talents, her speciality was weaving magic from the world around her. An enchantress. They had spent many a day speaking about her Moonkin form – a huge and vicious owl figure that scared him just to think she had the ability to manipulate nature to a point that she could create such a beast. She introduced herself as Eli. She said it was a nickname from her “previous life”. “Why Eli?” asked the boy. Eli looked at him. Her eyes seemed to penetrate his mind. “Does it matter?” she said “I have been known as Eli to my friends as far back as I can remember”. He didn’t push her too hard. It was obvious that she was confused about her future and what she wanted her future to hold for her. She said that she was an individual and was a girl brought up around boys. She had always stood up for herself however and now no male would dare come into conflict with her. She was an interesting sort. Dressed casually, he robes made her look calm, relaxed and non-materialistic – almost hippy-esque. He knew though that below the surface was a driven and dedicated Druid. She had told Helkpo of the day she had defeated Lunaclaw in the Barrens of Azeroth. She knew there was a Moonkin stone to visit, but had no idea of the battle that lay ahead. When she saw the Owlbear, instead of fear, she was in awe. She knew she would have to defeat this creature to continue her Druidic path, but this was one creature that she wanted to emulate rather than destroy. Helkpo listened to these stories in awe. They were so similar to his path to discovering his tree form, yet she had continued her life in a completely different direction. A week ago she had left Shattrath City for Netherstorm. She didn’t know if she would return. He knew this too – he had heard many stories about an electrically charged landscape and fearful Tempest Keep. He worried for her…… A needless worry, but a worry all the same. “I needed to know you were genuine – your story was too similar to mine” said Hélkpö “but I believe you now – our destinies are linked”. They had agreed to meet at the gates of Karazhan, and she had stood by her promise. And the there were 4. The “fifth” and “sixth” were now friends that Helkpo trusted and who he expected to be part of the Helkpii prophecy. Part of his mother’s dying words and now obviously part of other Tauren’s destinies. He had spent a long time with the “fifth”, and trusted his opinion and strength of purpose. At the time they met, however, confusion had once again set in. This one had been shamed and outcast by his tribe. Rejecting a world of nature and being one with the planet, the “fifth” had decided to move away from his tribe when a young boy and learn the ways of the Shaman. A common path for an outcast, he excelled in various tools of melee fighting, and totem creation. Helkpo had never seen anything of the sort. This Tauren had willingly moved away from the ones who loved him and started his own journey. Such bravery and determination instilled a sense of respect in the boy. He had been forced onto his path by the deaths of his parents, but this male had forged his own destiny. He had moved to a different tribe and even though he had not been accepted there, they had learned to appreciate his talents. He told Helkpo that he had been looking for a cause for years and breaking away from his tribe was the most liberating thing he had ever done. Learning to be a Shaman amongst Druids had been a humiliating experience for him. Forever the cause of jokes and constantly mocked, he continued to strive for perfection. His speed had improved over the years, his skill with axes was now sublime and he had learned to wear metal armour and still enjoy the dexterity to fight with vigour. He was occasionally blunt and crude, causing others to wonder why he would speak in such tones, but his parents still loved him and had stood by him even in the difficult times. Their pressure upon their tribe elders and their status in the tribe made the difference between his banishment and a quiet life of acceptance. He even carried documentation that proved that he could now be a Shaman, and continue to be accepted in Tauren Druid tribes. His name too was a derivative of Helkpo. The shock of meeting people with the same name as him wasn’t as much anymore. The boy was starting to expect these meetings. He was still not quite ready, but Helkpo knew that with his documentation, and the fact he was bringing talents that noone else could offer, Hêlkpô would eventually be a fully fledged Helkpii. Fate was playing an exciting game, and the Helkpii were seemingly key pieces. Helkpo got to his feet. He breathed deeply and proceeded to pack his bag. Looking at the setting sun, he looked at the distant tower. There were now more figures with Hélkpö. A frown crossed his face. What was this about? He hadn’t expected any others being here. Steeling himself, he set off down the dusty path. He sighed. This had been the saddest story. Helkpo remembered meeting this Druid in Stranglethorn Vale. They had stopped at a local inn and shared a meal. This Tauren was a fine figure of a male – a strong Druid, confident in his powers and slowly learning to control all forms, unsure as to what he would finally be. His life had not been easy. He had been held back all through his adulthood due to the severe mental disabilities he had. For the first 4 years of his life he could only communicate through guttural noises and it had become obvious at a young age that he was not able to speak or form words. He could only communicate through text and writing, and all of his conversation with Helkpo was done through text. Diagnosed dumb, he was been scorned. He had had lots of what he thought were friends, but they simply mocked him and kept him close so that they could have someone to point and laugh at. The Druid wished that he could speak and remembered fondly the years when he could create sound. To add to his issues, his writing was not impressive. Treated as a fool by most in his tribe, his schooling had suffered and was nowhere near the level of training he should have been at by this point of his life. His spelling had suffered as well and had caused issues throughout his life. With teary eyes, he finished writing his notes to Helkpo, telling him about his life and stating that his dream was to one day find a cure or at least learn some basic speech. He wished for real friends and a chance to prove that he was useful. Helkpo felt for him. It must have been an awful life. Helkpo smiled. He called the barman over and ordered another round “Ill have a drink, and one for +H here as well”. Walking to Karazhan he saw that with Hélkpö there were others gathered. Hèlkpò the Hunter was there with the mighty Hulkpo the tiger at his feet. Hëlkpo the first was there aswell and raised his head as Helkpo approached – nodding in greeting. With them there seemed to be legends of the world gathered aswell. A rogue sat at the base of the summoning stone sharpening his blades. A paladin was sniggering and sharing stories with a mage to the left of the entrance. An Orc Shaman was standing and casting totems on the floor seemingly engrossed in this. A warlock stood alone – away from the pack. He reeked malevolence. His eyes seemed to say “I’ll crush you one of these days”. Finally Helkpo’s eyes rested on a warrior. He was carrying a weapon that Helkpo had only heard of in legend - Thunderfury, Blessed Blade of the Windseeker. The warrior’s eyes met Helkpo’s. “We are ready. Let’s make this swift and successful”. Helkpo felt a surge of pride. Maybe it wasn’t too early. Maybe the Helkpii did have future. Maybe he would be able to rest the memory of his parents soon. Putting those thoughts aside, he nodded to the warrior and took his first steps into the foreboding tower. His life had not been easy. He had been held back all through his adulthood due to the severe mental disabilities he had: for the first 4 years of his life he could only communicate through guttural noises and it had become obvious at a young age that he was not able to speak or form words. He could only communicate through text and writing, and all of his conversation with Helkpo was done through text. I need to have latest posts in all catagories.